I have an Epson Stylus SX435W printer. Please could you tell me which inks to buy in tersm of the packaging e.g. Fox, Toger? In regard to the price per page of Epson CX6400 inks, does it mean that the ink will print the total number of pages stated e.g black '600' pages? Ink yields are based on a 5% average coverage of the page, this is the standard measurement used to determine the capacity of an ink cartridge. If you are covering more than 5% of the page the yield will be less. The Epson CX 6400 excels at all types of printing, whether that may be documents or images. In the long run your Epson CX6400 will polish off its printer ink, and then you'll soon learn that fresh Epson CX6400 ink can be really pricey. Fortunately you don't need to bother about coughing up the steep fees you'll see on the main street because here at Cartridge Save you can purchase all the Epson CX 6400 cartridges you'll ever want at very competitive prices. Spend less money on your ink by purchasing online at Cartridge Save! There's no point in forking out so much on the CX-6400 original cartridge or CX6400 compatible ink down the main street when it's simple to save some cash shopping online with Cartridge Save. Enjoy perfect satisfaction when you purchase Stylus CX6400 ink cartridges from us as everything is protected by a no quibble money back guarantee. Keep in mind that every single purchase also has free delivery, typically arriving at your address on the following day! The Epson Stylus CX6400 is built for a busy house or small office. It offers standalone features for printing, copying, and scanning. ThE Epson Stylus CX6400 multifunction printer has a maximum print resolution of 5760 x 1440 dpi and scanning of 1200 x 2400 dpi. It has memory card slots and a USB port for connectivity. Print quality is good, and the Epson Stylus CX6400 even offers borderless printing for photos. The only trouble with this printer is it tends to guzzle up ink. The Epson Stylus CX6400 all-in-one inkjet printer weighs 18.8 lbs and has dimensions of 23 x 17.75 x 12 inches. The Stylus CX6400 has extendable trays that can handle as much as 150 sheets. A flatbed scanner is on top and below it is a control panel, which features function buttons, numeric keypad, and an LCD. Memory card slots are located above the output tray. With the Epson Stylus CX6400 inkjet printer, users don't even need to turn on their PC's for several functions, including copying and scanning (there is a scan to memory card option). 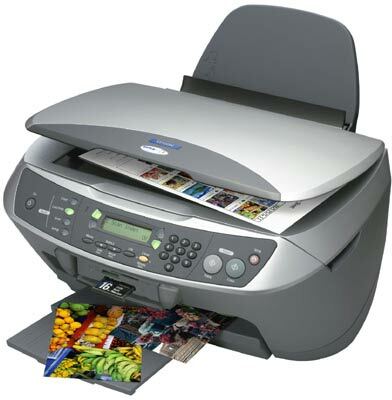 The Epson CX6400 printer also allows photo printing PC-free with the memory card slots and the scanner's index sheets. For use in the office, the Epson Stylus CX-6400 has a handy security lock function. The Epson Stylus CX6400 multifunction printer lacks a fax machine and also doesn't have built-in connectivity options. It would also be better if the LCD screen had a backlight. The Epson Stylus CX6400 colour printer also has some trouble with its ink cartridges clogging up.